Angela did not wish to go. She did not understand why she needed to leave her home, her brothers and sisters, and everything familiar. Her mother tried to her best to explain and to reassure her precious daughter. But, none of her motherâ€™s reasoned words belayed the fear and suspicion they stirred in Angela, that she was being punished. Her mother told her little girl that the Sisters of Temple-at-Delphi would care for her, as she could not. They would provide her with the special training only the Daughters of The Goddess could bestow. Only among the Faithful would she win more authority than Angela could ever achieve as a matron with older female siblings. Little psiSadewa Angela traveled many times to Temple-at-Delphi in her brief four years. She enjoyed the curious games she played with the Sisters. She relished the Sisterâ€™s delight every time she best themâ€¦ and she bested them every time. But, to live there? The thought frightened her. The Temple, with its wide, open spaces, its towering eerie statues and its strange smells, was not a home. 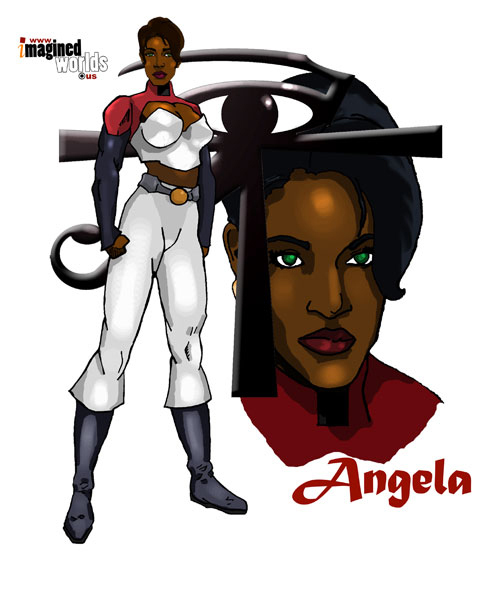 Despite her protests, her mother brought Angela before the Temple Sisters. As she entered the main mosque she had an epiphany. A vision of a place outside of time and space enraptured her awareness. She found herself transported to a plane neither of familiar matter nor of energy, but of pure thought and essence. It was a place where the mathematical splendor of Creation unfolded itself in perfect order and beauty. There were beings there, Angela perceived. They were many and at the same time one entity. They nourished on the force of life that permeated their world. The collective consciousness took supreme comfort in the knowledge that all things must conform to a precise inflexible equation. That comfort was a light that warmed Angela and welcomed her with an emotion alien to that plane. The emotion Angela knew to be home. The vision passed, become something as fleeting as a dream. Angela no longer feared to stay at Temple. As she grew to womanhood she always took comfort in her first vision. She knew if she tried hard enough that, one day, she might visit that perfect place again.